On The Trail, Even Republicans Spin Clinton Years Into Gold : It's All Politics In this year's presidential campaign, both parties are trying to use Bill Clinton's presidency to their advantage. Although he's popular and the economy was better then, it could be a risky strategy — because Clinton is not just a symbol. What a difference 14 years makes. 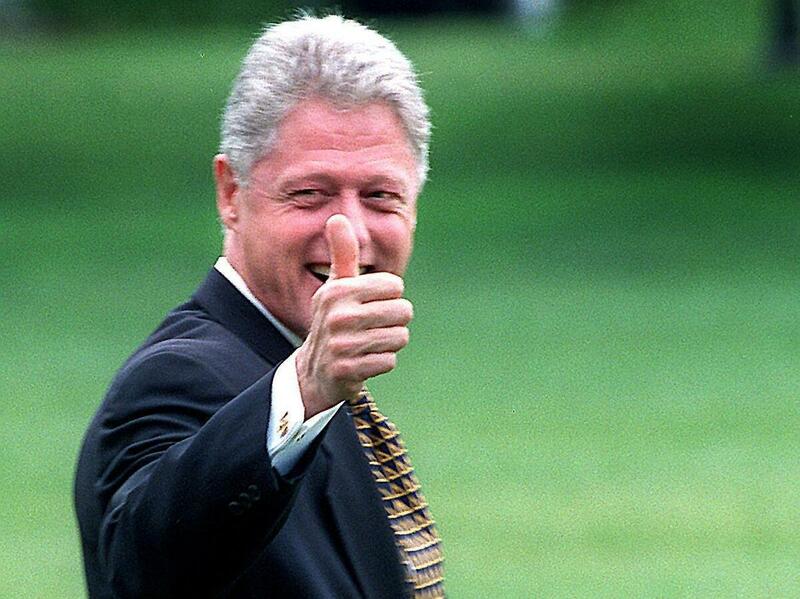 Here, Bill Clinton departs the White House on July 31, 1998, after telling reporters he wouldn't take questions about the Monica Lewinsky investigation. This week, the presidential campaign has been dominated by debate over the welfare law from the 1990s. It's just the latest example of how both sides are trying to use the Clinton years to their advantage — portraying them as a halcyon golden age. As long as Bill Clinton has been on the public stage, there have been people of both parties willing to say negative things about him. But this year, even high-profile Republicans are waxing nostalgic about Clinton's administration. "President Clinton got four consecutive balanced budgets," Newt Gingrich told CNN last week after Democrats announced that the former president will have a prime speaking spot at their national convention. "President Obama's had huge deficits. So I think having Bill Clinton there is going to remind people of the Democrat they used to like, and may in fact shrink Obama by comparison." On the campaign trail this week, Republican presidential candidate Mitt Romney has been applauding the Clinton welfare program as an accomplishment for the ages. "One of the things that happened in the last couple of decades was one of the greatest bipartisan successes we've seen. And that was President Bill Clinton and Republicans coming together to reform welfare," Romney said at a rally in Illinois on Tuesday. For Republicans, praising Clinton can show that they are not mindless partisans. It's a way of saying, "There are Democrats I like, just not the one in office right now." Of course, the Democrat in office right now has tried to co-opt Clinton's legacy, too. On the campaign trail, Obama makes it sound like he's running to continue the Clinton administration. "My theories have been tested. Last time they were tried was by a guy named Bill Clinton," Obama said last week in Portland. "And that's why I'm running for a second term as president of the United States. To go back to what works!" There's a simple reason for all of this Clinton hagiography: People like the guy. "He's clearly popular among independents and relatively popular among Republicans as well," says Andrew Kohut, president of the Pew Research Center. Kohut says today's presidential candidates are less popular than Clinton, and Americans look back on his presidency fondly. In the mid-1990s, there were no big wars and the economy was booming. "The majority of people rated the shape of their family finances as excellent or good. It was 56 percent. Today, only 41 percent do that. So harkening back to the era of prosperity associated with President Clinton in the second term, it would be a positive thing," Kohut says. But it could be a risky strategy for both parties, because Clinton is not just a symbol. Bill Galston of the Brookings Institution worked in the Clinton administration and knows full well that the man can throw a curveball. "Bill Clinton — because he's a living, breathing human being — will continue to talk, and as we've seen on different occasions, the longer Bill Clinton talks, the more likely it is that something interesting, in the political sense, will come out of his mouth," Galston says. Something "interesting" came out of his mouth on CNN in May — a comment about Romney that left the Democrats shouting, "Cleanup in aisle Clinton!" "There's no question that in terms of getting up and going to the office and, you know, basically performing the essential functions of the office, a man who's been governor and had a sterling business career crosses the qualification threshold," Clinton said. Republicans who mischaracterize the Clinton years might have to deal with the former president himself weighing in — as he did this week on the welfare debate. In contrast, when people deify Ronald Reagan, there is no chance that the Gipper will rise up from the grave and veer from the talking points.